The completion of the 21st Street Bridge in Tulsa did not bring forth the usual festivities reserved for such occasions. Instead, the public's attention was focused on the economic miseries of the country as it skidded into the Great Depression. Beyond that, the Sooner State shared with its neighbors in the region an additional disaster brought on by a drought that ruined farmers and produced the Dust Bowl. Oklahoma highways now became the way out for migrants anxiously heading elsewhere in search of jobs. Considering the tangle of federal agencies and programs, it is difficult to determine how much highway-related relief arrived in the state. However, grants from the Works Progress Administration (WPA) in 1937 alone amounted to more than $4,000,000. With the emphasis on work relief, primary attention went to projects that graded and graveled roadways, built small drainage structures, and improved roadsides through clean-up and beautification efforts. 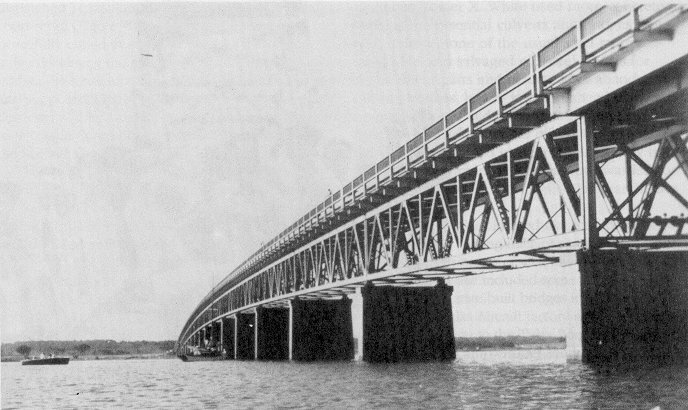 The highway commission observed that "few" bridges were provided for in WPA budgets for 1936 through 1938. 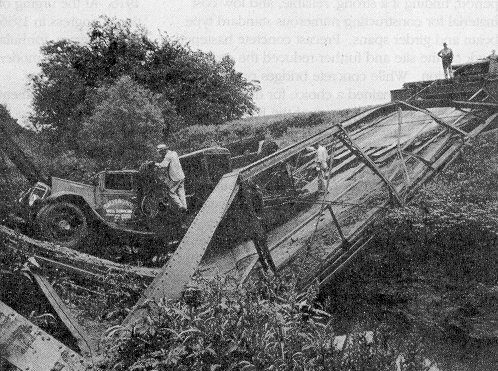 When bridge projects had WPA support they usually involved repairs and renovations, but the agency also provided funds for dismantling and moving trusses (Figure 36), constructing small concrete slab and girder spans, or installing masonry arches in recreational areas.49 The Civilian Conservation Corps occasionally added small rustic spans to state and city parks (Figure 37). Figure 36. The truss bridges could be redily relocated gave them an advantage over other types. Oklahoma made widescale use of this feature. This Pratt truss has been moved to a creek near Watonga. Figure 37. The Civilian Conservation Corps built Bridge 62N3570E1550001 in an Ada city park in 1934. Figure 38. 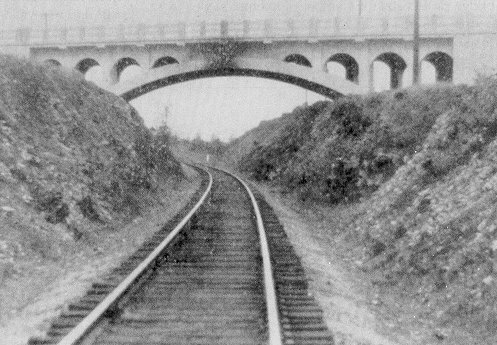 The Stilwell overpass, Bridge 0102 1232 X, shown in 1933, reflects the emphasis on replacing dangerous railroad crossings during the 1930s. Figure 39. Bridge 2106 1883 X, known as the Sailboat Bridge, was a major project of the depression era. 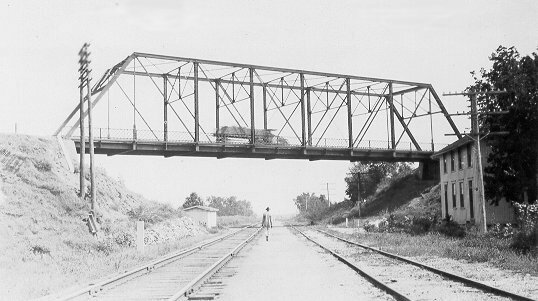 The K-truss in the Frisco overpass was a standard design that became an increasingly familiar sight on state highways during the 1930s. State engineers liked this through truss for the way it controlled secondary stresses, making it a sturdy and predictable design and a good choice for bigger projects. Bridge engineer J. A. L. Waddell proved wrong in his prediction of 1925 that "its inferior appearance will probably prevent its being used to any great extent".51 Oklahoma in fact made considerable use of the K-truss for about thirty years. Some of Oklahoma's largest bridges today have their origins in the 1930s. Emergency funds made available by Washington for building public works combined with more competitive bidding from firms in a depressed industry encouraged the construction of several major projects. As evidence of this trend during the decade, Oklahoma added twenty-four bridges, each of whose total length exceeded 700 feet. The Red River alone saw the addition of three principal structures: a 1,242-foot span at Colbert in 1931, one of 2,108 feet near Yuba in 1938, and another of 2,255 feet in 1939 near Waurika. Big bridges also went up over the Neosho River at Miami in 1935 and across the Arkansas River at Ralston in 1935 and Bixby in 1939. 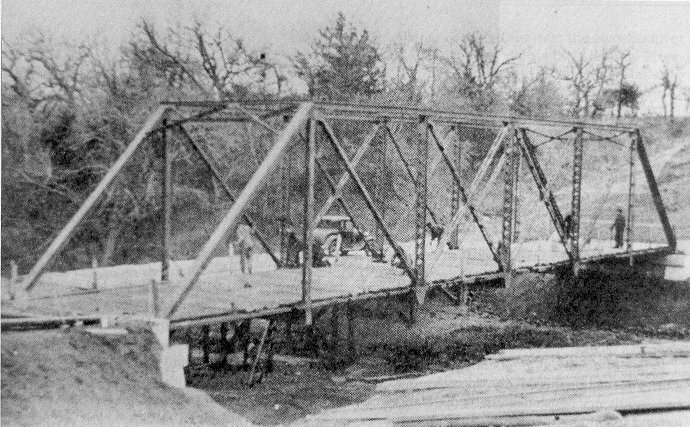 The Keliher Construction Company of Dallas combined a K-truss and thirteen deck trusses in 1933 to carry U. S. 70 over the Kiamichi River near Hugo, the bridge measuring 1,654 feet long. Figure 40. 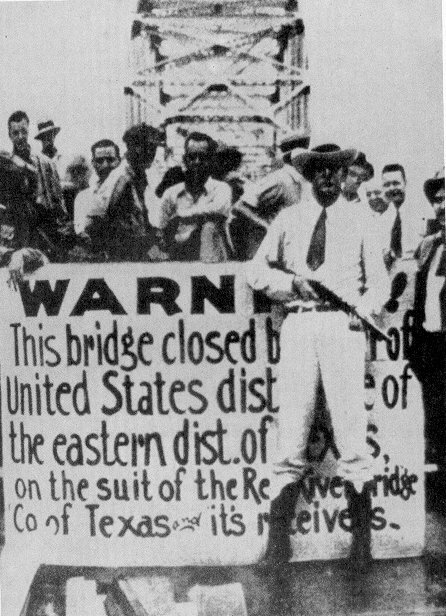 Life Magazine's picture of the "Red River Bridge War," showing the Durant-Denison "free bridge," Bridge 0702 0000 WX, closed by a Texas Ranger. Figure 41. The war and heavy oilfield traffic took its toll of truss bridges erected for use by horse and wagon.